Michigan AD Dave Brandon doesn't speak with media very often, especially not very candidly. 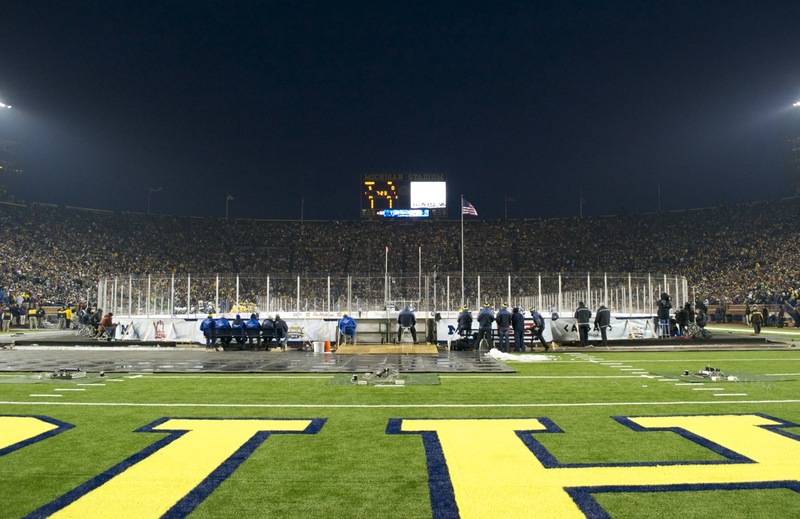 But Detroit News Michigan beat writer Angelique Chengelis sat down with Brandon on Saturday before the Big Chill event to discuss some random topics [Story]. One of them was the possibility of new scoreboards at the Big House. Q: You also have talked about new scoreboards for Michigan Stadium. Your vision is not Cowboys Stadium huge, but pretty huge? A: Pretty huge. 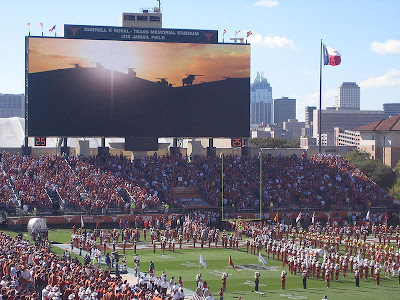 If you picture the size of those (current) scoreboards and maybe something that's 30 percent larger, 40 percent larger, but then the entire surface or at least the vast majority of the surface would be video screen. I think those scoreboards look wimpy now with this structure and then the fact the HD video portion is only about a third of the surface. We can't do what our fans want us to do in terms of showing them really high-resolution replays, game action and even a lot of the marketing stuff we're doing with videos and pre-game and halftime shows — these screens are just not acceptable. This is very old technology, and they don't look very good, either. Think 30 or 40 percent larger and think big-image area for high-definition resolution screens. I think our fans will love it. 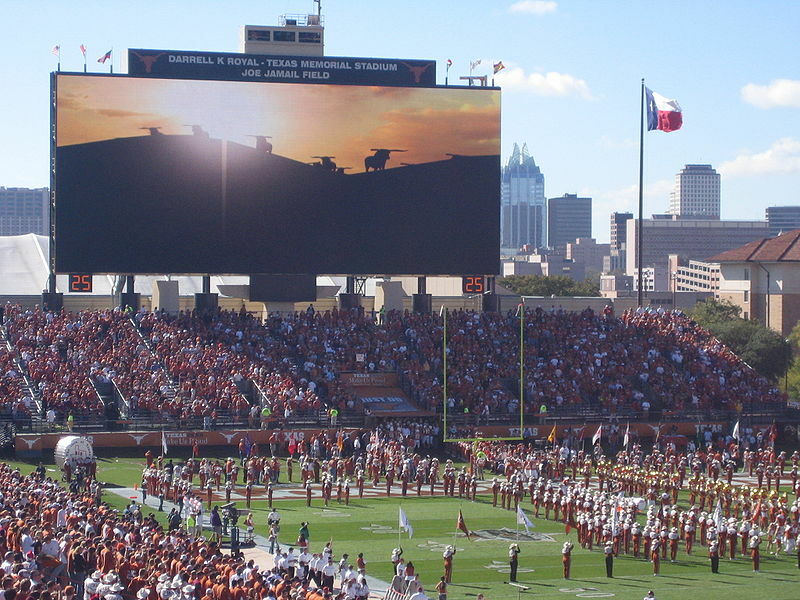 Q: So you think you'll have the scoreboards by next football season? A: Hope so. Subject to approval. It's certainly our hope we could have them in for next season. Could not agree more. The screens are way too small for such a huge stadium. The renovation should have included scoreboards. I think the new structures really make the scoreboards look dated and small. Not to mention the old 4x3 screens. We live in a 16x9 world. 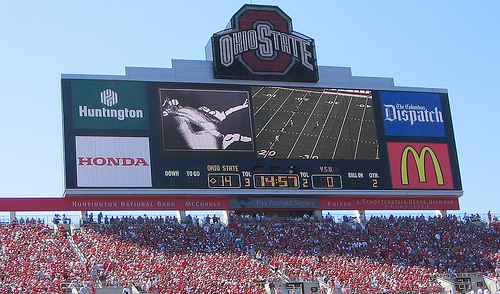 HD is here and it's time for Michigan to set the standard for college football scoreboards. The new boards should be all video screen. No permanent metal or lettering. Just one big video board. The University of Texas has set the standard. We can beat this. 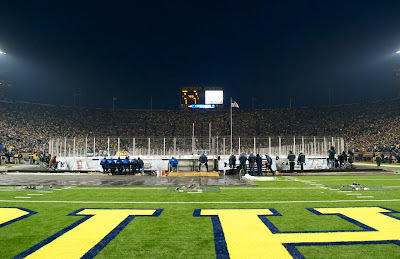 Among the other topics of interest (at least to me), was the presence of quite a bit of advertising being done inside Michigan Stadium during the Big Chill. From the ice to the boards to the animations on the scoreboards, it wasn't hard to notice ads everywhere. I was concerned this may be a sign of things to come. Not so, says Brandon. The entire article is really a good read, and worth a click. Well I would not say that would be the worst thing that could happen to your stadium!